In Alaska, and especially in early June, there is nothing more fun than catching grayling and rainbow trout with a floating pattern on classic dry-fly waters such as the Brooks, Copper, and Upper Talarik Rivers. But don't think these dry fly patterns work only in Alaska. We stock the hottest and most reliable dry fly patterns for the entire Rocky Mountain region. You'll find patterns here that will take you from early spring, through the Mother's Day Caddis hatches, the Stonefly explosion in June/July, and late season hatches of October caddis, Tricos, and Blue-Winged Olives. Stock up now! The Adams is a favorite dry fly pattern in all types of waters for grayling, trout, and Dolly Varden. Popular dry fly on the Gunnison, Madison, Yellowstone, Gallatin, Missouri, Animas, Piedra, Rio Grande, Conejos, and South Platte Rivers. Sizes: 12, 14, 16. 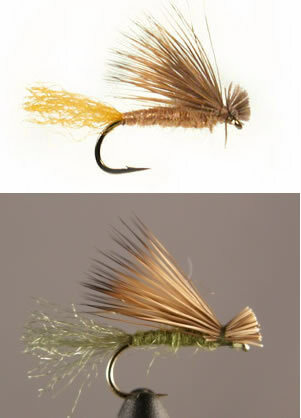 The Parachute Adams is one of the most popular dry fly patterns. 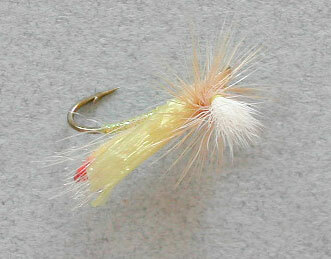 It is the number one fly pattern used on Colorado trout streams. Covers dark mayfly duns, some Trico hatches, and particularly effective during the Callibaetis hatch. Very popular dry fly pattern in Alaska, and a must have fly for the Madison, Yellowstone, Gallatin, Boulder, Missouri, Animas, Piedra, Rio Grande, Conejos, and South Platte Rivers. Sizes: 12, 14, 16. 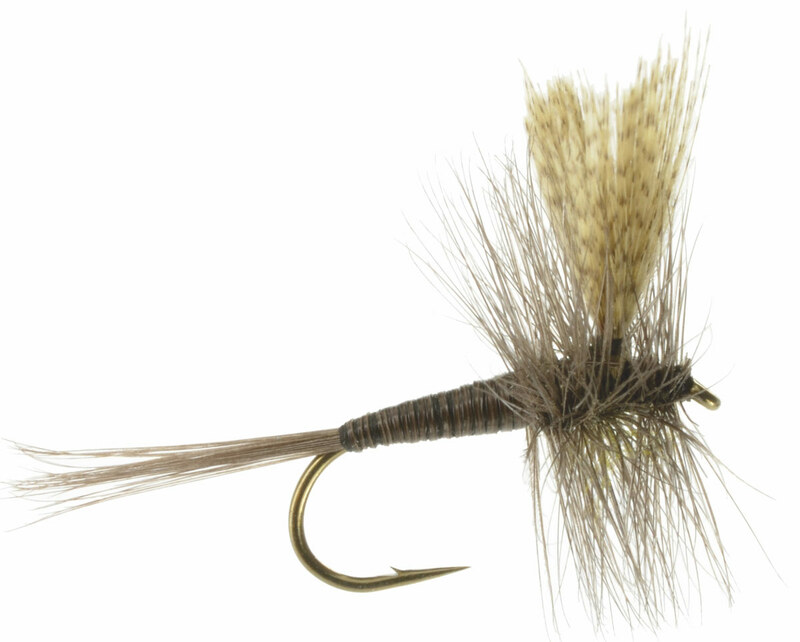 The Black Gnat is a reliable and effective dry fly pattern for trout, grayling, and char. Grayling, in particular love this dark pattern sipping it from the surface like there's no tomorrow. 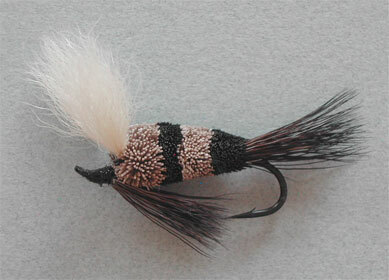 All black pattern that has proven to be the most effective version of this venerable fly. Sizes: 12, 14, 16. The Blue Wing Olive, or BWO, is the most plentiful species on the Gunnison River. 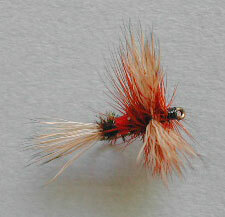 It is in the top ten fly patterns used in Colorado. A must-have dry fly pattern for the Madison, Yellowstone, Gallatin, Missouri, and Armstrong Spring Creek. A good choice for south-central Alaska area streams that have hatches of Baetis. Great pattern for grayling, trout, and Dolly Varden. Size: 16. 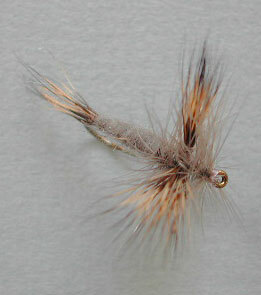 The Elk Hair Caddis is one of the world's top dry fly patterns. 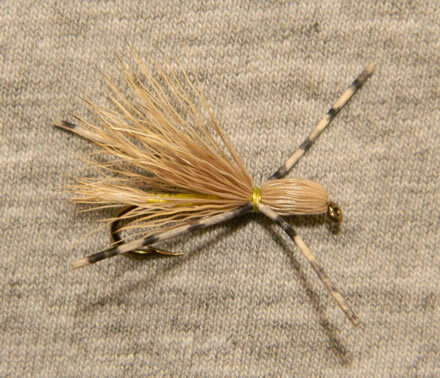 In olive, the Elk Hair Caddis is a terrific dry fly to use on the famous Mother's Day Caddis Hatch on the Madison, Yellowstone, Gallatin, Armstrong Spring Creek, Boulder, Gunnison ("Gunny"), and all over Colorado. 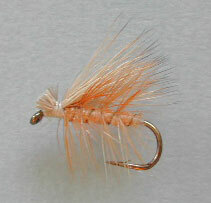 Good pattern for grayling and trout to imitate adult caddis (Grannom). The tan Elk Hair Caddis is great for imitating sedges and other light bodies caddis throughout the season from June through September. Mustad Signature R50 hook. Sizes: 12, 14, 16. Colors: Tan, Olive. 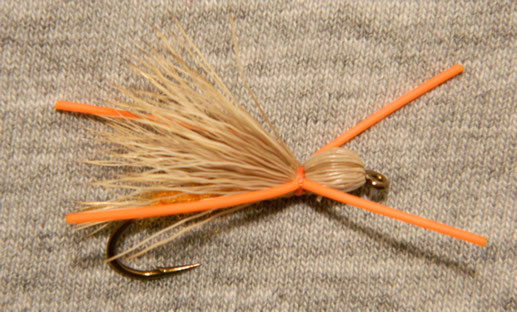 When the giant salmon flies are hatching in June and July, this is the floating pattern you want to skitter across the water surface for explosive action. The unique hook and extended body construction guarantees better hookups. Best giant stonefly fly pattern on the Gunnison River. 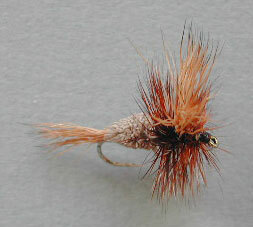 Also a must have dry fly for the Madison, Yellowstone, Gallatin, Boulder, and Missouri Rivers. Orange foam body, bullet head, rubber legs. Mustad Signature C38 hook. Size: 6. The Grey Wulff dry fly pattern is one of the best to cover darker hatches and is particularly effective in broken water for rainbow, grayling, and Dolly Varden. 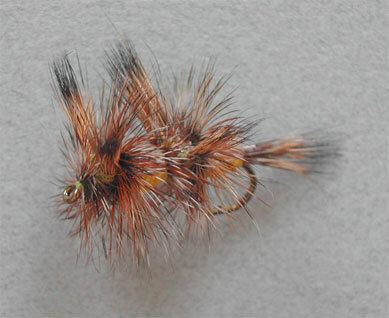 Very popular dry fly pattern for Rocky Mountain and Alaskan streams. Mustad Signature R50 hook. Size: 12, 14. 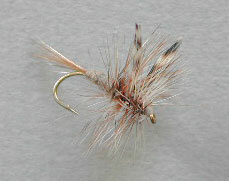 The Griffith's Gnat mimics a cluster of adult midges and is arguably the most effective dry fly for grayling. Dan Heiner, in his book Alaska on the Fly , claims this is his favorite pattern and that it "catches grayling at the surface like there's no tomorrow." In streams, fish this pattern by allowing the fly to float free with the current. On lakes, cast the fly beneath overhanging vegetation. Mustad Signature R50 hook. Sizes: 14, 16. Fantastic early season pattern for the Yellow Sally hatch, June through August. Extremely popular dry fly pattern in Montana, especially for the Yellowstone and Madison Rivers. In Colorado, used with great success on the Gunnison; in Utah, the Blacksmith Fork River; and in the Great Smokey Mountains on Porters Creek (Middle Prong of the Little Pigeon River). Easy to see parachute fly for both fisherman and trout. Mustad Signature C53S hook. Size: 16. 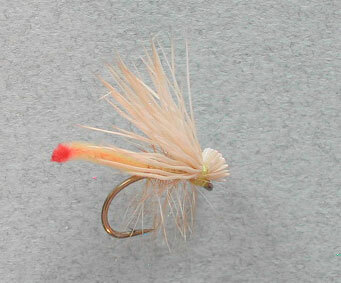 Excellent pattern for fast, broken water when you need a pattern that is visible and floats well. Works just as well on quiet waters too. 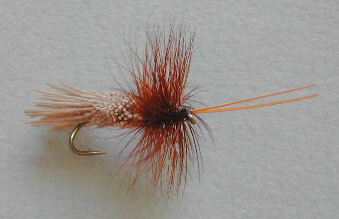 Extremely popular dry fly pattern in Alaska and on Rocky Mountains streams. Known in Montana as the Goofus Bug. Green for terrestrials, yellow for light bodied hatches, red for an attractor fly pattern, and black for darker hatches. Grayling particularly like black bodied dry flies. Sizes: 12, 14, 16. Colors: Yellow, Fl. Green, Red, Black. Works like the Humpy, but twice the meal! May be taken for a mating couple. A larger pattern for larger trout. Yellow body. Mustad Signature R72 hook. Size: 10. 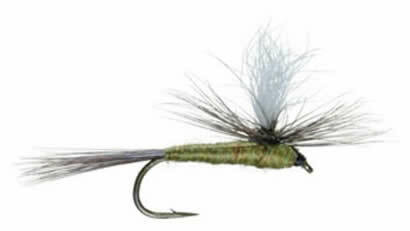 The Irresistible is among the top 10, if not top 5, dry flies. 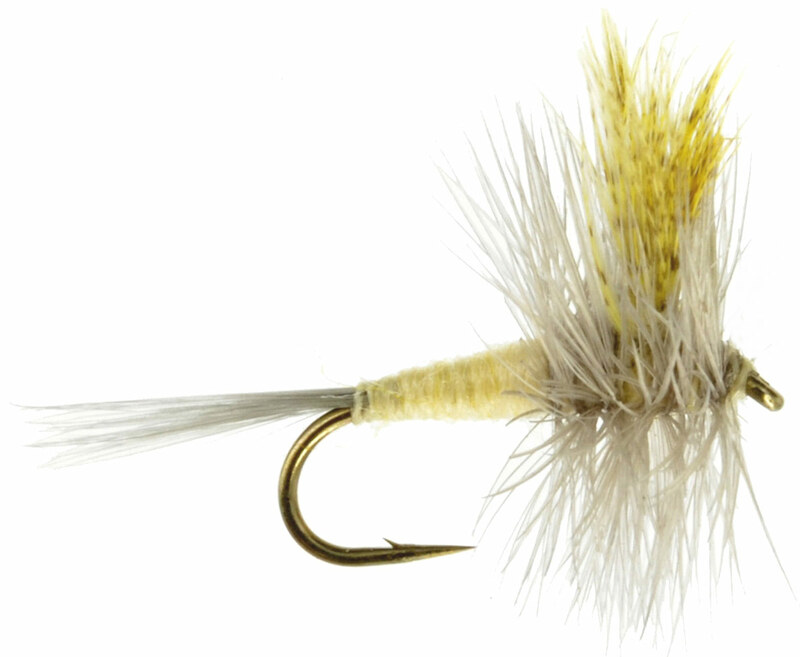 It is one of the most popular dry flies in Alaska for rainbow and grayling. Floats like a cork all day long. Experienced fishermen will use a Sharpie to draw black circles around the deer hair body to imitate a bee; a very successful tactic for grayling. Mustad Signature R50 hook. Sizes: 12 and 14. As the early Quill Gordons begin to fade on Eastern streams, the Hendrickson (Ephemerella subvaria) start hatching on April afternoons. This species has prolific hatches that stretch from Eastern streams to the upper Midwest. Some of the better known hatches occur on the Pere Marquette and Pigeon of Michigan, the Namekagon and Brule of Wisconsin, as well as the venerable streams of the East such as the Beaverkill, Brodheads, Battenkill, Otter, Saranac, and of course, the Ausable. Must have pattern for your fly box. Size: 14. An early season (June through August)and top producer everywhere. Very popular Rocky Mountain pattern, as well as Great Smokey Mountains, mid-western states such as Wisconsin, just about anywhere a Yellow Sally hatch occurs. Superior dry fly pattern on the Gunnison, Madison, Yellowstone, Gallatin, Boulder, Blacksmith Fork, and Porters Creek (Utah). Mustad Signature C49S hook. Size: 16. 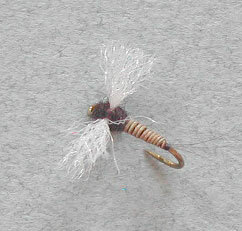 Developed for the West Yellowstone area for finicky trout, this caddis pattern imitates the point where a caddis has emerged and is still trying to shake off its nymphal shell. 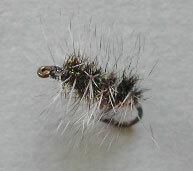 Caddis are particularly vulnerable at this point and make for easy pickings by hungry trout. Superior pattern for the Gunnison, Animas, Piedra, Rio Grande, Conejos, Madison, Yellowstone, Gallatin, and Boulder Rivers. Especially useful on spring creeks such as Depuy Spring Creek and Armstrong Spring Creek. Mustad Signature R50 hook. Size: 14. Colors: Olive, Tan. Take a Madam X, supersize it, change the body color to orange, add orange rubber legs, and you have a dynamite October Caddis pattern to use from August to November and from the Rockies to the northern half of Alaska. A must-have dry fly pattern on the Madison, Yellowstone, Gallatin, Boulder, Missouri, and Gunnison. Also good attractor pattern to use all season, anywhere. Mustad Signature R70 hook. Size: 8. Although the Light Cahill covers several lighter mayfly species, it is most often associated with the Maccaffertium ithaca. It is primarily an Eastern species, but produces fishable action on many Midwest streams as well. Good lighter pattern to have in your fly box. Size: 14. Hatching from late March through May, Epeorus pleuralis is one of the earliest Eastern U.S. mayflies. Its range covers basically the entire breadth of the Appalachain Mountains. 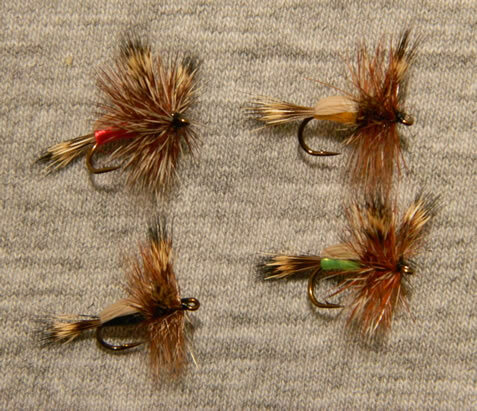 A "go to" early season fly pattern on streams like the Cane in North Carolina, Delaware on the PA/NY border, Paulinskill of New Jersey, the Great Chazy and Ausable of the Adirondacks, Esopus of the Catskills (where the pattern is known locally as the Gordon Quill), Farmington in Connecticut, and Battenkill of Vermont. Stock up now for Spring. Size: 16. Has there ever been a more successful pattern? 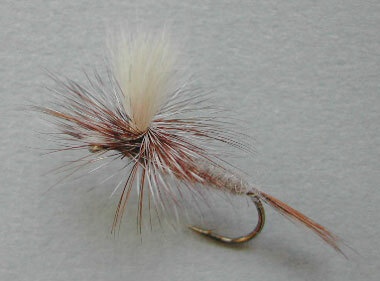 The Royal Wulff dry fly pattern is probably the most famous and recognized dry fly in the world. Originating in the venerable New York trout streams of the Catskill and Adirondack Mountains, it is now used the world over. Great producer for grayling, all species of trout, Dolly Varden, and Arctic char. Mustad Signature R50 hook. Sizes: 14, 16. 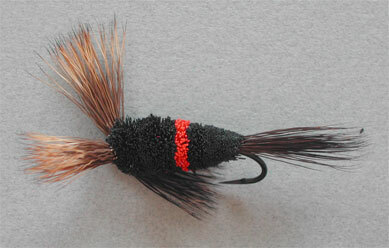 Very popular throughout the Rockies, the Speckled Madam X should be used anywhere there are trout. The speckled legs create a segmented look and improve this favorite yellow-bodied bullet head fly. Great dry fly pattern for the Gunnison, Animas, Piedra, Madison, Yellowstone, Gallatin, Boulder, and Missouri Rivers. Best used on a dropper rig. Mustad Signature R70 hook. Size: 10. Imitates any number of midge or tiny mayfly spinner falls. Trout slurp these up by the mouthful. Extremely popular on spring creeks such as Armstrong and Depuy. Must-have dry fly pattern for the Madison, Gallatin, Gunnison, and South Platte Rivers. Mustad Signature R30 hook. Size: 22. Need a top water model that pushes the most water? Great fly for Alaskan rainbow, Atlantic salmon, steelhead, and silvers. The Waller series of flies are very popular from Washington to British Columbia to Alaska and Russia. This is the original waking pattern. Black Mustad Signature 80500 up-eyed salmon hook. Size: 4. 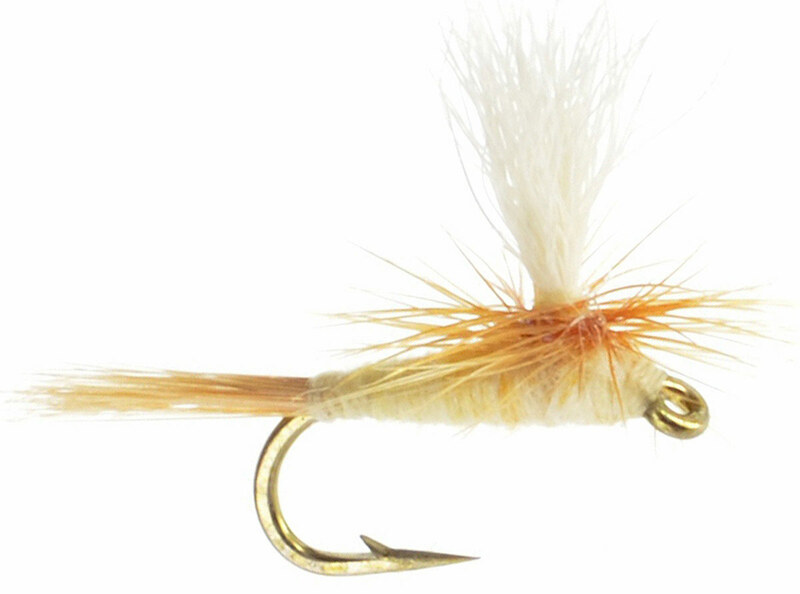 Just as popular as the Waller Waker, this high-floating waking fly is a favorite of steelhead and Atlantic salmon fishermen. The black and orange color is perfect for late season. Some call it the "Halloween fly". 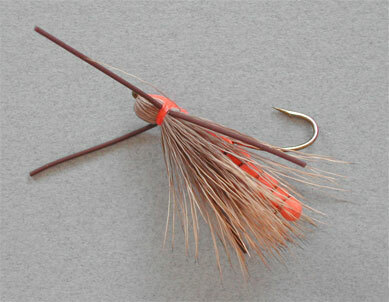 Black Mustad Signature 80500 up-eyed salmon hook. Size: 6.